If you missed it, I did a fill-in strip for Dresden Codak, check it out. That one WAS a planet. @Coyoty, huh. Did you read it to mean that Gurf was seeing one of the planets the Eebs had torched? Because I simply meant it to be that they were passing by a solar system, and so it twinkled in that way how planets in our solar system to us look like stars. Doesn’t really matter one way or another, but if there’s confusion, i might tweak it. Sadly the eclipse wasn’t much better in Portland. The sun was nominally visible through the clouds, but I couldn’t see the eclipse happening. I didn’t notice any darkening where I am in Idaho. I remember the eclipse in 1977, it got really dark for a few minutes even though the totality path didn’t come anywhere near the US mainland. I wonder what sort of aircraft scientists use to chase eclipses since the Concorde and SR-71 planes are no longer flying? They used to charter a Concorde to chase the eclipse so they could get a longer observing time. IIRC at least once an SR-71 had the rear seat replaced with an upward pointing camera rig for that purpose. Easy to keep pace since the Blackbird can fly over 3 times faster than Earth’s surface speed at the equator. Eclipse chasing would be kinda slow for those airplanes. Christopher- there isn’t confusion. or if there was, it wouldn’t matter. No, Planets don’t and in spacer stars don’t either, twinkly is an atmospheric effect. 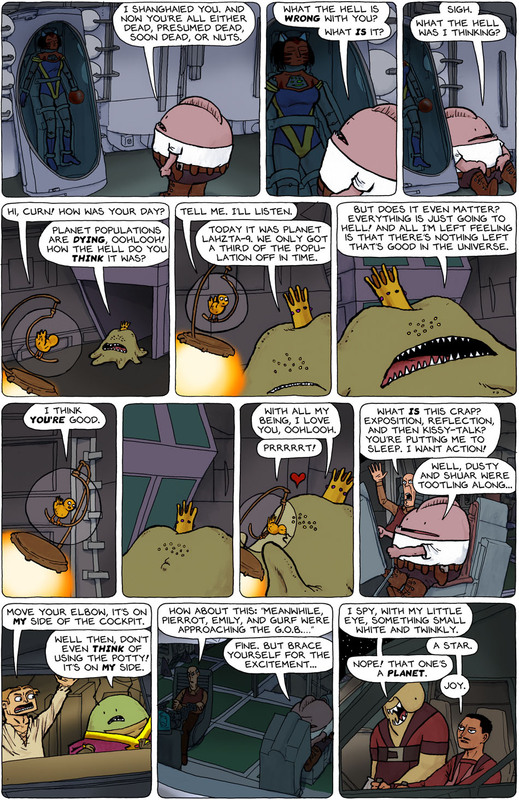 Should Gurf be saying “…small white and twinkly” rather than “…small white a twinkly” in the last panel? I know how you feel about Seattle. I missed Halley’s Comet back in 1986 because Portland was completely overcast. And in unrelated news, I think Coyoty was just being snarky about the Eebs. I’m sure they’ll torch his planet next. 🙂 …. wait! Don’t ever, ever change Mr. Zorilla! It’s Gurf! Of course it’s going to be grammatically incorrect! We couldn’t see the eclipse in Colorado, either. Grrr…clouds. Had about 80% of the annular eclipse here, but I was too wiped from work to really get into it. I did notice at the local peak of the eclipse that weird stuff was happening with the light and shadows. It was a cloudless day but the light was like that of an overcast day. Shadows were mostly fuzzy but sharp at the upper left area, and where you would usually see spots of light in a shadow (like light coming through tee branches) you instead say arcs of light, and all of the arcs where the proportionally the same and all were the upper left portion of a circle. That effect lasted about 20 minutes, then everything went back to normal. Here in Ohio we were spared any effects of the eclipse. And why do so many posts say the same thing about harmed gerbils? Did I miss a memo? Ah, Dusty, Dusty. Perhaps it’s a miracle that he let Shuar drive. Granted, he probably has no idea how to pilot a ship, but I wouldn’t that would necessarily stop him from trying. Also, I got my original art from the Kickstarter today. It’s awesome, Chris, thanks! The only way those planets are “twinkling” is that they are on fire. And as we have been told, the mass murdering homicidal Eebs are at it full tilt demented revanchist mode. Using their incomparable brilliance to make it so. Wheeeee! Just arrived here from the first strip. Too bad i was late for the kickstarter 🙁 when can we buy book #2? And What is a Draak-Sim and why does it rotate? And you know who the character with the saddest fate of all is? Dustin’s brother Bill! Re: Alan Rickman in slo-mo. Remember, Guile’s Theme goes with Everything.